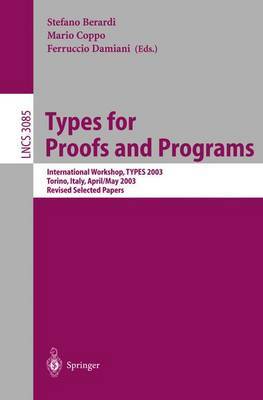 These proceedings contain a selection of refereed papers presented at or related to the 3rd Annual Workshop of the Types Working Group (Computer-Assisted Reasoning Based on Type Theory, EU IST project 29001), which was held d- ing April 30 to May 4, 2003, in Villa Gualino, Turin, Italy. The workshop was attended by about 100 researchers. Out of 37 submitted papers, 25 were selected after a refereeing process. The ?nal choices were made by the editors. Two previous workshops of the Types Working Group under EU IST project 29001 were held in 2000 in Durham, UK, and in 2002 in Berg en Dal (close to Nijmegen), The Netherlands. These workshops followed a series of meetings organized in the period 1993-2002 within previous Types projects (ESPRIT BRA 6435 and ESPRIT Working Group 21900). The proceedings of these e- lier workshops were also published in the LNCS series, as volumes 806, 996, 1158, 1512, 1657, 2277, and 2646. ESPRIT BRA 6453 was a continuation of ESPRIT Action 3245, Logical Frameworks: Design, Implementation and Ex- riments. Proceedings for annual meetings under that action were published by Cambridge University Press in the books "Logical Frameworks", and "Logical Environments", edited by G. Huet and G. Plotkin. We are very grateful to the members of the research group "Semantics and Logics of Computation" of the Computer Science Department of the University of Turin, who helped organize the Types 2003 meeting in Torino.